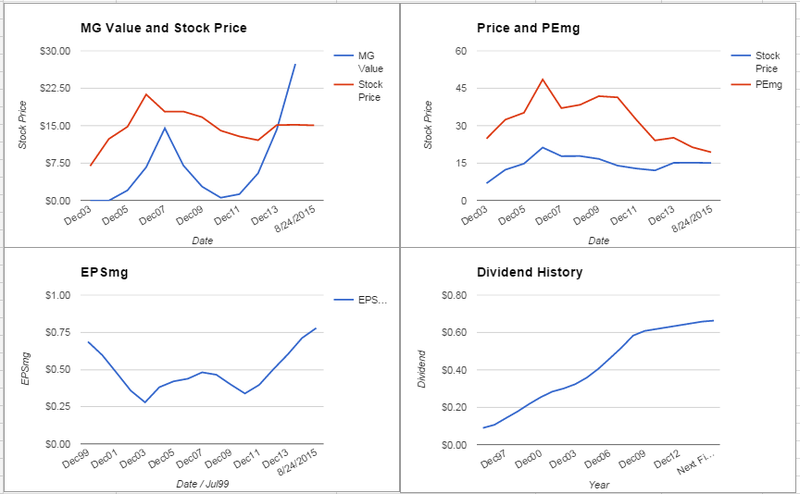 What follows is a specific look at how People’s United Financial Inc. (PBCT) fares in the ModernGraham valuation model. Company Profile (obtained from Google Finance): People’s United Financial, Inc. is a savings and loan holding company. It is a holding company for People’s United Bank (the Bank), a federally-chartered stock savings bank headquartered in Bridgeport, Connecticut. The principal business of the Company is to provide, through the Bank and its subsidiaries, commercial banking, retail banking and wealth management services to individual, corporate and municipal customers. The Company’s operates through three segments: Commercial Banking, Retail Banking and Wealth Management. In addition, the Treasury area manages the Company’s securities portfolio, short-term investments, brokered deposits and wholesale borrowings. In addition to traditional banking activities, the Bank provides specialized financial services: personal, institutional and employee benefit trust; cash management, and municipal banking and finance. People’s United Financial Inc. is suitable for either the Defensive Investor or the Enterprising Investor. The company passes all of the requirements of both investor types, a rare accomplishment indicative of the strong fundamentals. As a result, all Enterprising Investors following the ModernGraham approach based on Benjamin Graham’s methods should feel comfortable proceeding with the next stage of the analysis. As for a valuation, the company appears to be undervalued after growing its EPSmg (normalized earnings) from $0.40 in 2011 to an estimated $0.78 for 2015. This level of demonstrated earnings growth outpaces the market’s implied estimate of 5.44% annual earnings growth over the next 7-10 years. As a result, the ModernGraham valuation model, based on Benjamin Graham’s formula, returns an estimate of intrinsic value above the price. The next part of the analysis is up to individual investors, and requires discussion of the company’s prospects. What do you think? What value would you put on People’s United Financial Inc. (PBCT)? Where do you see the company going in the future? Is there a company you like better? Leave a comment on our Facebook page or mention @ModernGraham on Twitter to discuss.